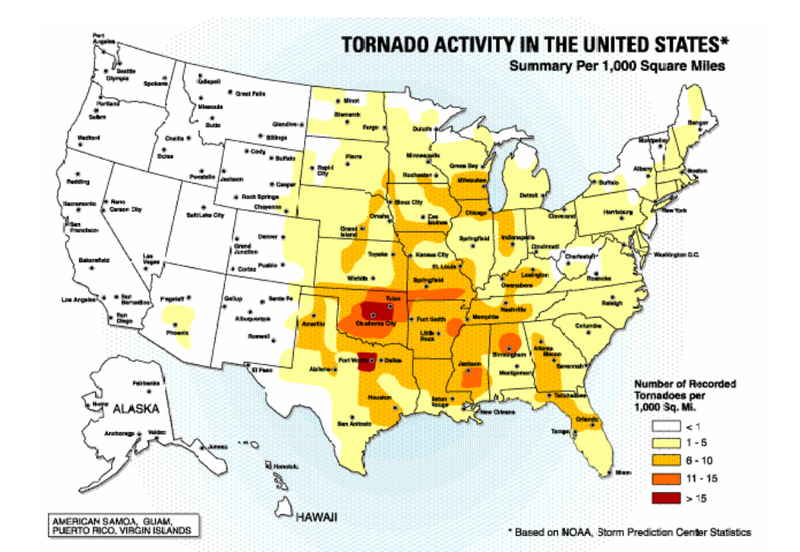 Image Source: CANHMP Tornadoes occur mostly in the central plains of North America, east of the Rocky Mountains and west of the Appalachian Mountains. They occur primarily during the spring and summer – the tornado season comes earlier in the south and later in the north according to the seasonal changes in relation to latitude – usually during the late afternoon and early evening. They have been known to occur in every state in the United States and every continent on the earth, any day of the year, and at any hour. At the last Monroe Council Session, Katharine Piaskowy, Emergency Planner for Butler County Emergency Management Agency, discussed tornados in Ohio. She also emphasized the importance of having citizen volunteers who comprise what is called SKYWARN (www.SKYWARN.com). Storm spotters scan the skies during peak tornado weather conditions and work with their local communities to watch out for approaching tornadoes. SKYWARN is an effort to give the community an even more advanced warning of an upcoming tornado event in the city. Doppler radar has made it possible to detect most tornados, but SKYWARN is the 'last mile' in detecting tornadic weather conditions and actual tornados. The National Weather Service (NWS) receives spotter information and then distributes that information by pubic radio and television. More information: 2012 WARN Annual Training Session.